Malls are notorious for being the refuge of bored teenagers, Orange Julius, and Hot Topics across the country. Hardly places where you&apos;d find something like, say...AN INDOOR SKI SLOPE. New Jersey, pioneers of the shopping mall since the 1980s, have crafted a new way to get shoppers interested in its new retail center. 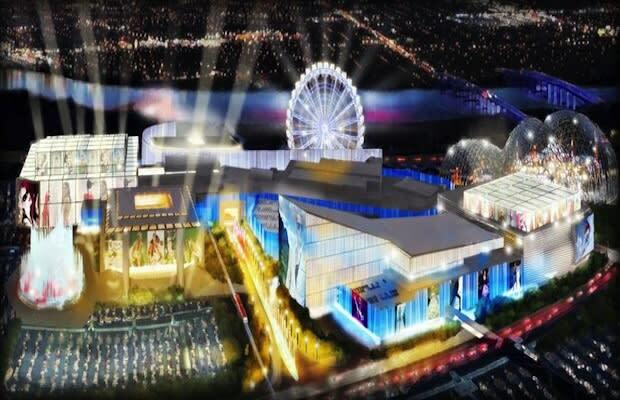 The American Dream Meadowlands (formerly known as the bizzarely-named American Xanadu) promises to become more amusement park than shopping mall, with plans to include a Cirque du Soleil performances, a ski slope and the nation&apos;s largest Ferris wheel. The list goes on. Regardless of the attractions inside, malls are still about shopping, and the American Dream Meadowlands does not look to disappoint. Names like Uniqlo, Topshop, and Zara are all planning to move into the space, with sizes that will either rival or dwarf their locations in Manhattan. Malls can certainly be corny, but this might just become a new destination for those looking to shop for big-name city brands, in between hitting the slopes and a Cirque du Soleil show.